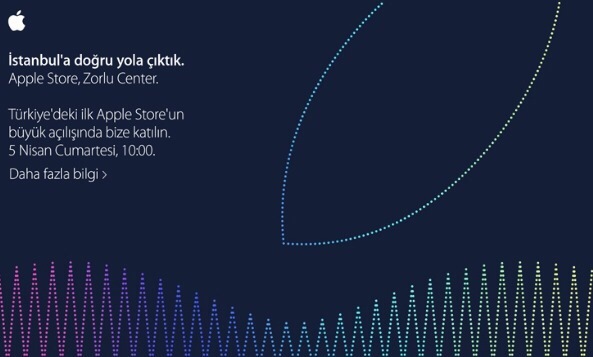 Apple is ready to open its first retail store next week in Turkey, with a grand opening gala that may feature Apple CEO Tim Cook and Turkish President Abdullah Gül. Located in Istanbul's Zorlu Center Shopping Center, the retail store will open at 10:00 AM on Saturday, April 5, 2014, reports Elma Dergisi. The Turkish store occupies approximately 20,000 square feet in the heart of Istanbul's popular, multi-use shopping center. The Zorlu Center store is thought to feature a cubic glass ceiling, glass sides and in-store services such as a dedicated "Family Room" floor and dual Genius Bars, reports 9to5Mac. The structure is currently hidden behind barricades until its official debut. 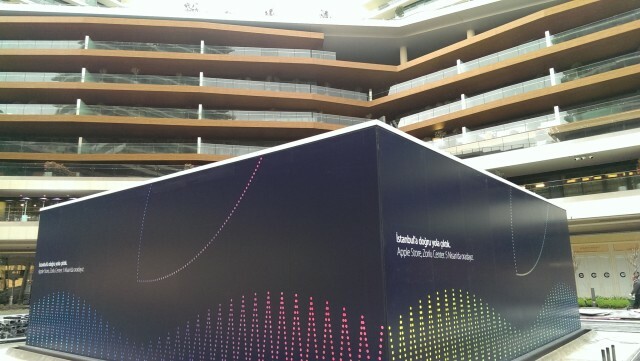 This Zorlu Center store is the first of several retail stores planned for Turkey as Apple makes inroads into this new market. Apple also met with Turkish government officials to equip Turkish school children with 10.6 million tablets in a new education initiative to bring cutting-edge technology into schools. Though negotiations appeared to be favorable for Apple, this bid eventually was awarded to Turkish company Telpa, which is providing tablets from General Mobile, a Turkish-owned company operating out of the United States. Coloured dots forming the top quarter of the Apple logo on the banner represents the iconic Bosphorus bridge's lights. The bridge connects Europe to Asia. Istanbul literally is a city located in both Europe and Asia. Here's a photo of the bridge. Also Apple is said to open 4 more stores in Turkey by the end of 2015. One, located in the Asian side of Istanbul was photographed under construction, in a mall called "Akasya". I'm pretty excited about this cause it means decent Apple customer service, Apple care, international guarantee and probably product launches simultaneously with the world. Up until now it has always been US, UK, Germany, France launch, then second tier country launch, then 3rd and then Turkey. If iPhones were launched early-Sep, it would officially arrive to Turkey mid-november. If this could move us up to at least 2nd tier it would be amazing. Can you test YouTube in the store? I read a tweet about that. If I were Apple, I would hold off the opening until the free internet speech "issue" is resolved and the government comes to its senses. Apple shouldn't turn a blind eye to these matters. How much you wanna bet this post will get moved to the politics forum? Should they stop selling in the USA until the NSA stops spying on people? Loving the logo design on those banners, very nice! Did you see the picture above of THE most holy Islamic site? Just poor taste, IMHO. And this is coming from someone who is NOT a bleeding heart type. I know what Mecca is. But there are tons of rectangular or box shaped buildings everywhere in the world. It's just silly to assume that muslims would take offence on box shaped buildings any more than christians would take offence of the letter "t". Steve Jobs adoptive mother was a survivor of the Armenian Genocide which was perpetrated by Ottoman Turks. Steve visited Istanbul as a tourist once and asked his tour guide this, "You, Muslims, what did you do to so many Christians? You subjected 1.5 million Armenians to genocide. Tell us, how did it happen?". The Turkish tour guides denials further infuriated Steve Jobs, who left Turkey one day early. I don't know how much of a historian Jobs was but you need a tutor. Most of the killing of the Armenians were done by the Kurds. And Jobs should have also asked the same question to Armenians, because they killed hundreds of thousands of civilians living under the Ottoman Empire back then. And I still find it funny that somehow store openings about Turkey end up being a political discussion where a Chinese store opening newsstory would never become about how the Mongolians ransacked villages 500 years ago.